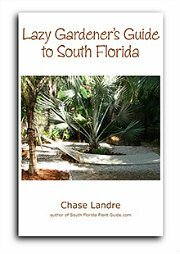 This page details all the basic South Florida planting tips you need to know to get a new plant off to a great start. Dig a hole one and a half times as wide and as deep as your new plant's pot. Add soil amendments (see below) and mix with the soil in the bottom of the hole. Remove the pot from the plant's base, and gently loosen the roots. 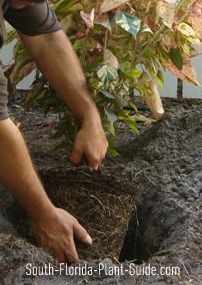 Grasp the plant at the base with one hand and use the other hand to support the root ball. Set the plant in the hole. ll air pockets are forced out. The top of the soil around the plant's root ball should be even or just a little higher than the soil level. Adjust the level by adding more dirt and soil amendments if the plant is sitting too deep. Remove dirt if the plant sits too high. Remove the plant. Fill the hole with water. Set the plant in the hole and backfill around it with the dirt you removed to make the hole. Firmly tamp the dirt in place. If you plan to mulch around the plant, set it a little on the high side. Mound the dirt at an angle up to the edge of the rootball. Mulch only up to the edge of the mound, keeping mulch at least 6 inches away from the plant's base. Just because they're small and compact now doesn't mean you can jam plants close together. 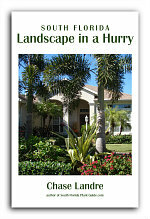 South Florida has a long growing season and plants need room to grow. Correct spacing is very important to a plant's longevity and beauty. 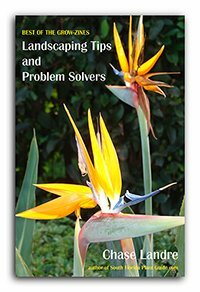 Overcrowding in a landscape also means more work for you. If you dislike that newly planted look, add annuals or perennials in between...or buy bigger, more mature plants. If you're instructed to plant 3 feet apart, this usually means "3 feet apart on center." From the center of the first plant to the center of the next should measure approximately 3 feet. 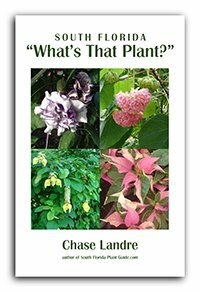 The Plant Pages will tell you the soil amendments, plant spacing and any special planting tips for each plant. Our sandy soil has no real nutrients. Amending the soil gets a plant get off to a good start. Just add soil amendments to the hole when you plant. Don't work them in elsewhere - you'll just give weeds a happy home. Organic peat humus or top soil helps the roots retain water long enough to take a drink. Composted cow manure enriches the soil, encouraging the plant to root. A combination of cow and peat works for most plants. The formula is 1/3 cow, 1/3 peat (or top soil), and 1/3 dirt, all mixed together in the base of the hole. If you use only peat or top soil, use 2/3 peat and 1/3 dirt. Do not use potting soil. It's too light and the plant may sink too deeply or fall over later. NOTE: Certain plants take specific soil amendments. For instance, palms prefer top soil (or organic peat) only. Always consult the Plant Pages before you plant. Water once a day for 3 to 5 days. Then back off to twice a week, then once a week in winter. If you're planting in summer, keep the frequency to 2 times a week - or even 3, if it's been very dry. For large plants, palms and trees, create a dirt "bowl" or trough around the base of the plant. Fill the bowl with water 2 or 3 times. Do this once a day every day for 3 to 5 days. Then gradually reduce the frequency until you're at a normal level. After a month, knock down the bowl. Hortasorb® helps keep the plant watered longer, and you can add it when you plant. Hortasorb comes in a small packet. You'll add it to water (follow the formula on the packet). Swell it up ahead of time - preferably overnight. Any excess can be kept a long time in a tightly-lidded container. Pour several scoops of pre-swelled Hortasorb into the hole just before setting the plant in. Every time you water a plant, the Hortasorb rehydrates and helps keep the plant from going too dry between waterings. Staking is helpful against windy conditions. Some fast-growing plants don't have the density of wood that slow growers do and can snap in two during a strong gust. Staking is good for any young plant with some height. 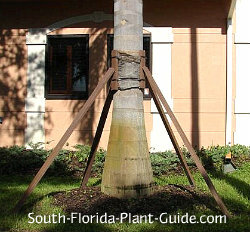 For tall palms and trees, use a staking kit to keep the trunk straight and the plant upright in windy weather. For small trees or tall shrubs, use a wood or bamboo stake. Tie the plant to it with green tie tape made specially for plants. This tape will expand as the plant grows. Don't wrap too tightly. Planting in South Florida is different from anywhere else. Follow these planting tips and - with regular care - your landscape plants will grow to be happy, healthy and beautiful.